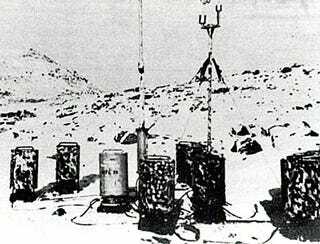 Did you know there was an abandoned Nazi weather station on the coast of present-day Canada? Until 1981, almost nobody did. The blog post where I first read the story suggests that weather warfare would make for an amazing book-as it happens, much of James Fleming's recent Fixing the Sky: The Checkered History of Weather and Climate Control is about exactly that. In an absurdly interesting paper called "The Climate Engineers," for instance, originally published in the Wilson Quarterly, Fleming quotes General George C. Kenney, former head of the Allied Strategic Air Command: Kenney once declared that "the nation which first learns to plot the paths of air masses accurately and learns to control the time and place of precipitation will dominate the globe"-first-strike meteorology, perhaps. Fleming goes on to describe hallucinatory military visions of a "perfectly accurate machine forecast combined with a paramilitary rapid deployment force" that could annihilate all enemies-a Global Weather Corps, so to speak, flying ahead of the storm winds that it itself would generate.